In 2012, Enniscorthy Castle was successful in securing Heritage Council funding to undertake research into the rare medieval wall art that is visible in the dungeon of the Castle. Dr. Rory Sherlock was engaged to undertake research into it origins, possible date, and conservation. 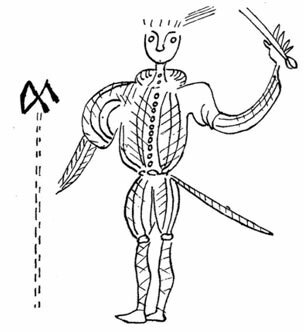 The history of halberdier posed more questions than answers, and it was our intention to attempt to ascertain its origins, date, and best methods for conservation. Following initial analysis, it became obvious that the wall art has considerably more detail than originally thought e.g. buttons on its ‘tunic’, cheeks and a mouth, and hachured clothing. However, from an analysis of other wall art, these would have a very prominent placement in any site, whereas this halberdier is in a dungeon. It is unknown whether there was other wall art throughout the castle that has now been lost, or whether he was the only piece created. It is now obvious that he is more than a mural, his clothing is in fact engraved, and with some considerable skill, but again, further consideration will have to be given to comparing him to other sites both nationally and internationally. We are also aware of an archaeological report that talks about the possible anglo-norman castle’s ditch, and the question has now been posed as to whether the dungeon of the present castle is actually set within that ditch as the dungeon is set into bedrock that would have required considerable effort to dig it out. This again could impact on the reasons for his location in this site. Dr. Sherlock’s report is available to download here.